I was inspired by the black and color splotches. Masculine cards are never easy, but I think this should work for a birthday card. Thanks for stopping by. Scramble time...if you have read my blog for a bit you know I LOVE the Hero Arts scrambles that occur every two weeks. Ninety minutes to make, photograph, and upload to the Flickr gallery your card based on parameters provided by the hostess at the start of the 90 minutes - its fun and it gets your mojo going. I try to give myself 75 minutes for the card; then I have 15 minutes to photograph and upload. That seems to be the best time division for me. I don't feel rushed, because I know I can photograph and upload pretty fast with my iPhone and my two favorite iPhone photo apps. Photomarkr - allows you to photograph and add a watermark, then I open it with Camera Awesome for cropping, fine tuning, and uploading right to the Flickr gallery. Both apps work on the iPad too; I just like my iPhone camera better. 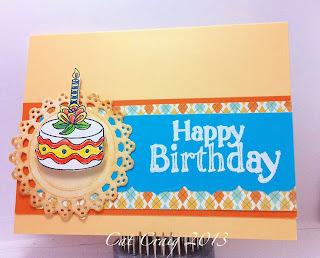 Here is my card, our theme was to make a celebration card be it birthday or other. I haven't made a birthday card for a while that wasn't for a specific person. So I enjoyed just putting a card together for my stash. Below are the card front, the envelope back and the card interior. My SIL is having a birthday today. She is fun, a wonderful wife and mother. I hope she likes her card. I started out with the big Hero Arts Medallion stamp (S5356, which looks like a big floppy flower to me) embossed in white on white, then inked it in Memento Angel Pink. 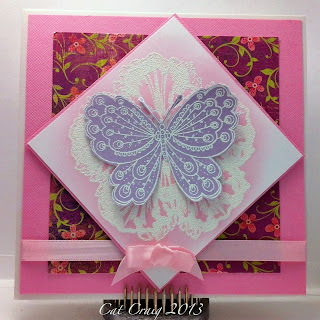 I matted it and then laid it on a diagonal on top of a square card base with some patterned paper and another pink mat. Some ribbon was added and a center pearl. It still looked lonely...so I took off the pearl and added the white embossed Hero Arts Artistic butterfly on lavender paper. Another Masculine birthday card. I really like the vintage stamps, they seem perfect for the men and boys. They are a bit gritty, and not at all frilly. PERFECT! 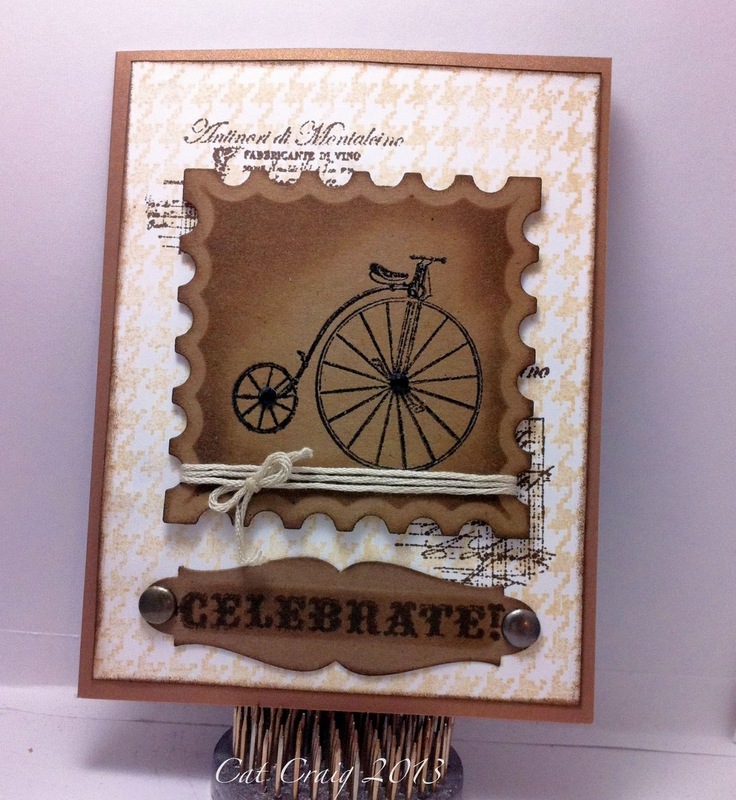 I am very happy with the way the Distress Ink in Walnut Stain really enhances the vintage feel of the stamp. 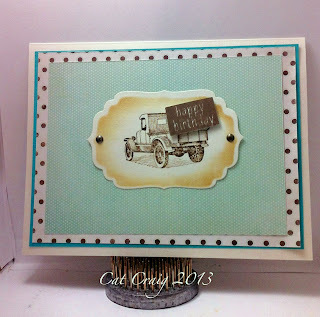 I used a hexagon stamp with Happy Birthday inside to make the "load" for the truck, just cutting off the top and bottom so it would fit better in the truck bed. A bit of inking around the image, and done. The man birthday card...difficult! Harder for friends; easier for family. I did find two similar stamp sets that I am going to use for a lot of man cards this year. Today the main image and some of the background is a Hampton Arts set. It is nostalgic set that I think works well for those guy cards. I have two this week. First up, my BIL is having a birthday this week, and I wanted to make him a special card. He is a super guy, great husband and father. I hope he likes it. It is actually one of my five favorite man cards, I really enjoyed putting this one together. 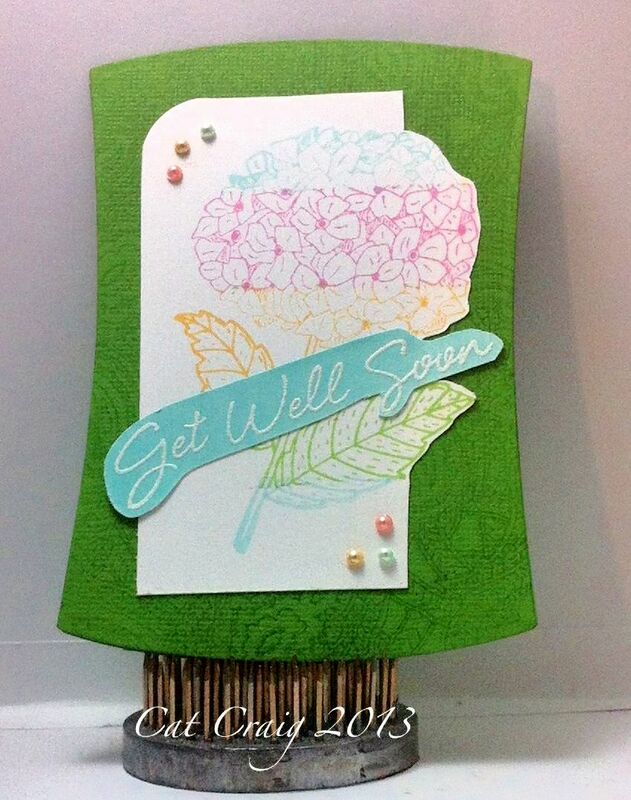 Sympathy cards, tough to make when you need one, tough to make just to have one around. This one is for an immediate need. 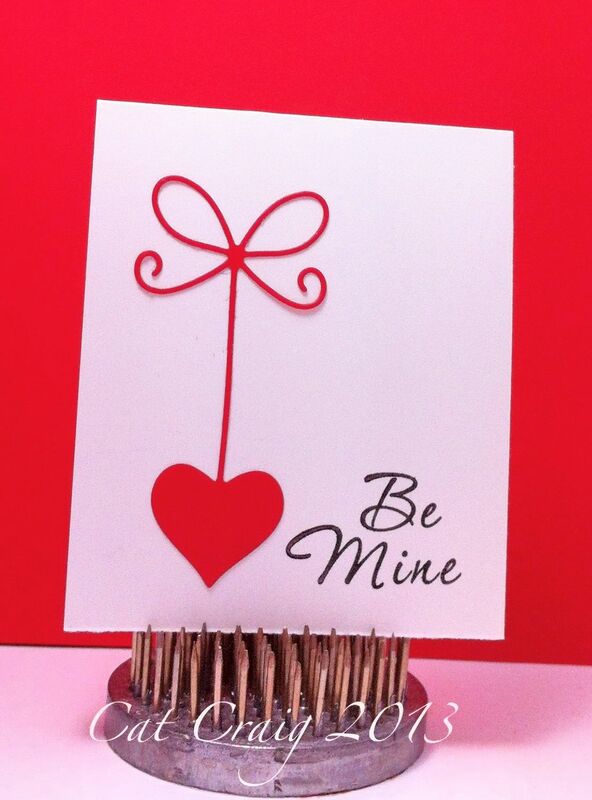 A very thin mat, some scoring around the image, a simple sentiment, a neutral bow. These two are for Hubs. Kraft was my only concession to trying to make them somewhat manly. 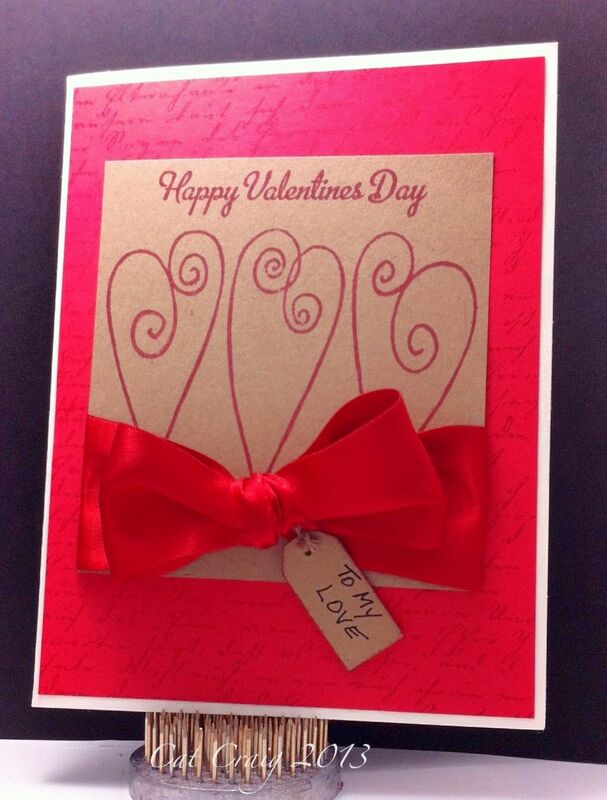 He doesn't mind a bit of frill on a Valentine's card. He was away at the dentist, so I hurried to get them done while he was out of the house. There are very sweet loving verses inside the cards. I think he will smile when he opens them up. I finally got some Valentine's made to send out to family late last week. I had been lamenting that I did not get them done in time to mail them to Loveland, Colorado to have them hand stamped and sent out from there. 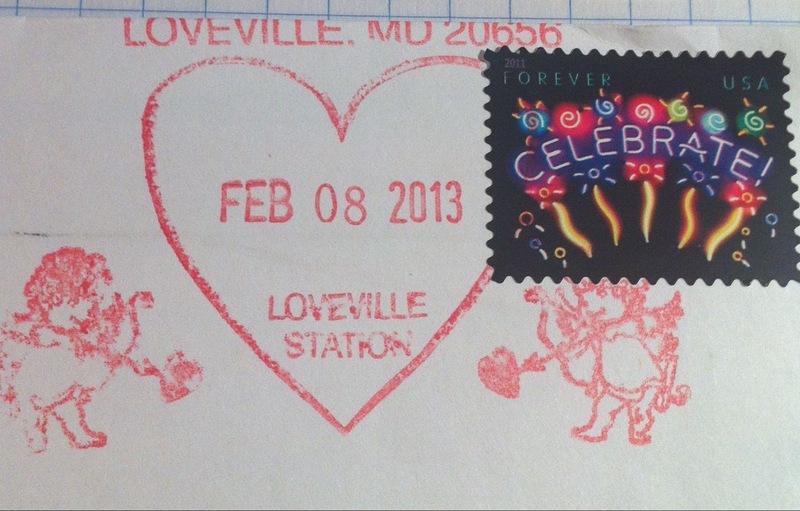 Hubs suggested we drive to Loveville, MD to mail the cards. So we took a road trip and found this tiny postal outpost in a trailer. Not happy just dumping them in the mail bin, I went inside and asked if they had any sort of special post mark for Valentine's. It turns out they did, so I left the cards there (including one for hubs and I just to see the mark). Two days later we got it back, and it had cupids and a heart. I had run out of love stamps, and had just put a celebrate on the one coming back to us, but you can see the mark here. I think it adds just a bit extra to the Valentine. 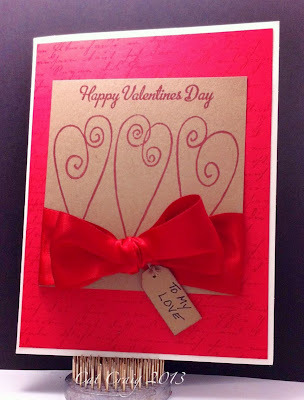 The Valentines all use Hero Arts Shadow inks in either Red Royal or Bubble Gum or both, papers are from Pinecone Press or Reminisce, the stamp set is Stampin Up You Are Loved. I have a friend that I swap cards with each month. I have had a bit of a procrastination issue this month and put this together last minute. However, I like the way it turned out. 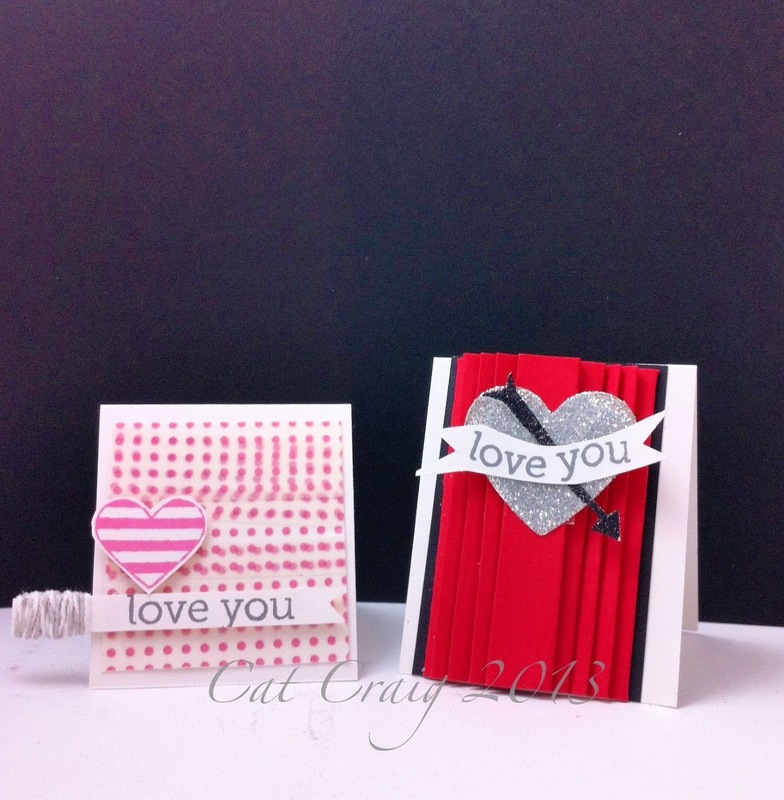 I used scraps left over from my family Valentines. I punched the top of each strip with the top of a heart punch, and the bottom of the strip with the bottom of the same heart punch. I did the same with the sentiment strip. 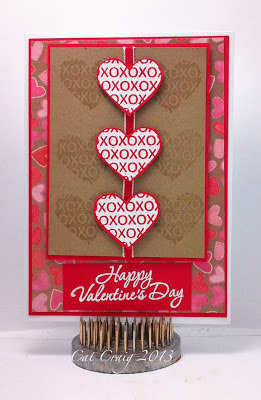 The background was made with a double heart stamp and versamark on linen look paper. 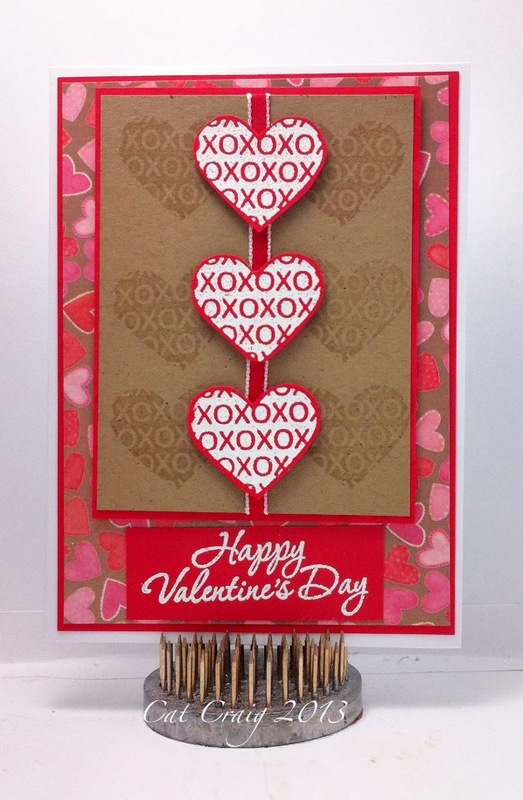 The sentiment was stamped to finish it, and three of the cutest little heart buttons were added. They are thick little suckers....but that is what makes them so cute. I participated in another Hero Arts scramble over at the HA Flickr group on Sunday. It is 90 minutes to make your card, photograph it and finally upload the image to the gallery based on the theme given to you at the start of the 90 minutes. I used to get so stressed with these, even though I loved the challenge. Not anymore, it is really enough time. The topic was SPRING, and whatever inspiration we took from that. For me it is flowers, I love em! 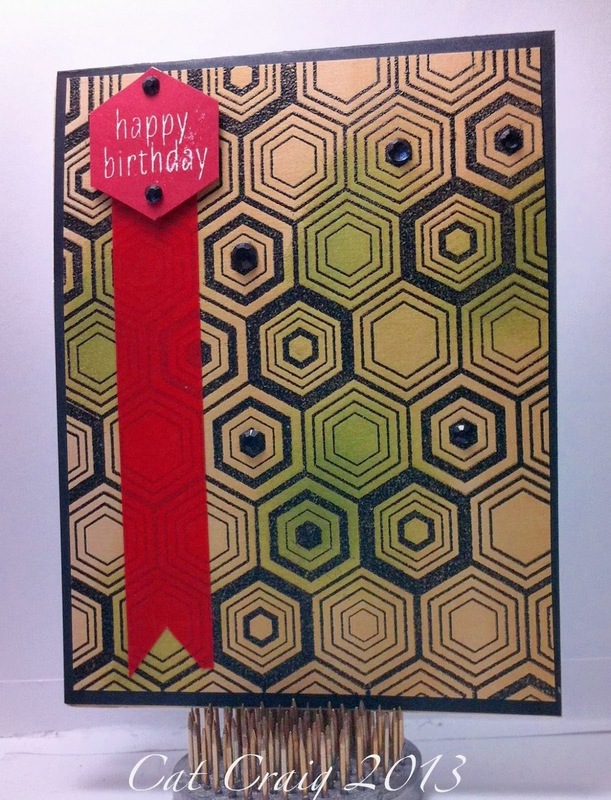 I love embossing, I think it adds a richness to the feel of the card. Embossing on Vellum is sometimes a bit of a trick, but it worked out fine. 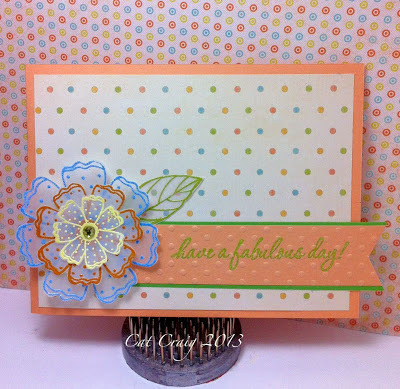 I picked colors for the flower from the polka-dot background, and used a yellow gem in the center. I'm not a fan of fussy cutting, but this was worth the effort. I made this card for a card swap organized through the Love Group at Flickr. I used my favorite technique, heat embossing with a sweet Inkadinakado heart stamp. Its definitely a girly card! 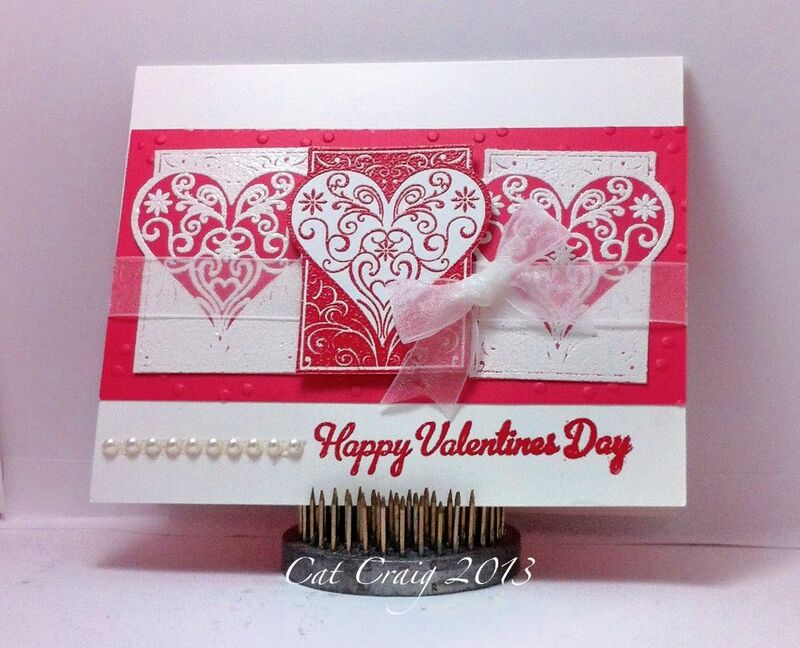 Deep pinks and reds, with a bit of white ribbon and pearls. Hi, back again with more homework...yes completed at 3 am this time...hence the mini cards. They are kind of cute. I might just go back and redo every day with a mini card for my notebook. I made two of the day 9 cards from items on hand, which meant relying on some hand cutting of the label and arrow. I loved the folding technique we were shown. Since this is a mini card I made folds at 1/4 and 1/8 inches. A little tight for the fingers to manipulate, but a really cool piece. Day 9 was about adding texture. Since I am washi impaired, I also tried out the wrapped washi card. Its kinda cute. These cards measure 2.25 x 2.5 for the pink, 2.75 x 2.25 for the red. 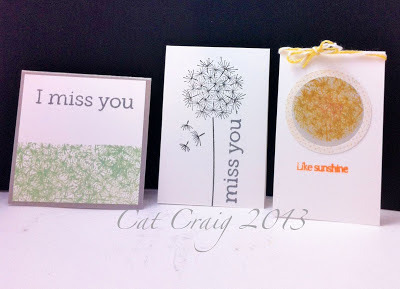 I used Hero Arts stamps on both days homework, and one sentiment from Lily of the Valley. 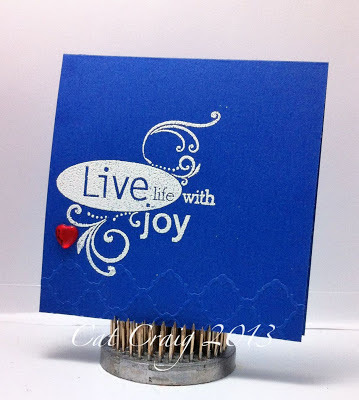 Day 10 was 1 stamp 6 ways. Our homework was to try 3 ways. I had fun with the little dandelion stamp. These cards measured (from left to right) 2 3/8 square, 2x3, and 2x3 inches. I have enjoyed the class and I did much better keeping up with the homework this go round than I did with the previous class. The best part is the lifetime access to the content. It has been fun...there may be one more bonus day, I won't find out until after I get up. 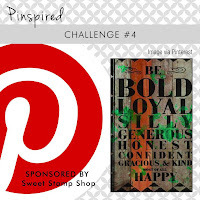 I started following Melissa's blog Love My Scraps almost a year ago. 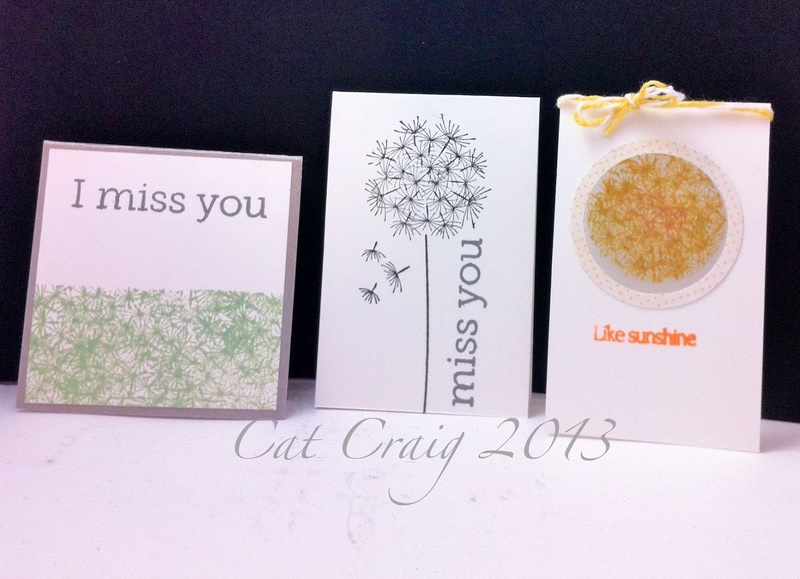 She is a prolific and fun styled card maker. She makes it look so easy. She often contributes cards to Operation Write Home, and other card drives. She is part of several design teams. Congratulations Melissa, on reaching 100 followers for your blog. I made this card for her, trying my best to incorporate twine and washi; two things that come to mind when I think of Melissa's cards. Melissa is having a give-away to celebrate her followers. So head on over to her blog. Big stamps or Li'l stamps...I have neither here really...unless you count background stamps. 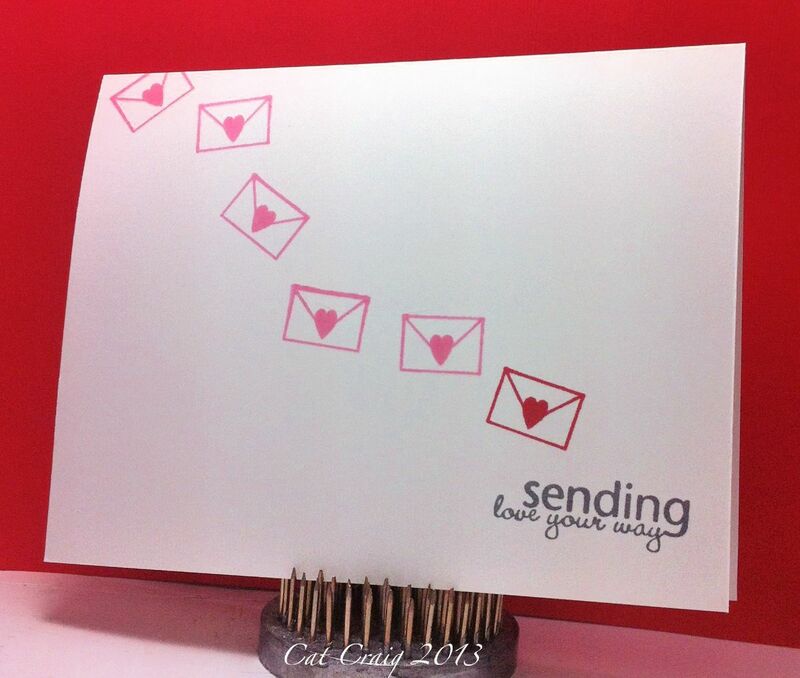 So the smallest I had was part of a Unity Stamp set called Sending my love. There are the cutest small envelopes. One has a flower seal, and one a heart seal. Given its February, and my Valentines need a good swift kick...start. I went with the heart. 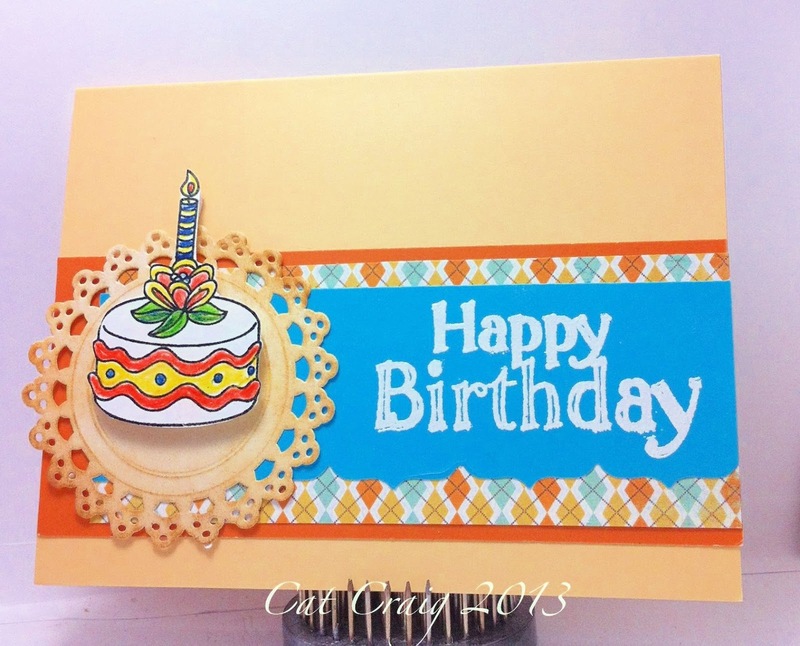 I traced a wavy line using one of my Kiwi Lane templates on to some Stampin Up whisper white card. Then used Bubble Gum, Royal Red and Charcoal mid tone shadow inks from Hero Arts to stamp the card. The envelopes followed the wavy line down to the sentiment. Today we were offered 3 lessons and three sketches along with techniques to choose from for our homework. I chose the sketch which went along with a masking technique. Masking is just so far out of my comfort zone, I am confronting it. Over the weekend I was covering some boxes with shelf liner...and guess what, the brand I used Magic Cover was very low tack...what does that remind you of? Masking paper/tape/sticky notes perhaps? YEP, I used shelf liner for my masking. No sticky residue, the paper is very thin vinyl like and it peels up easily. 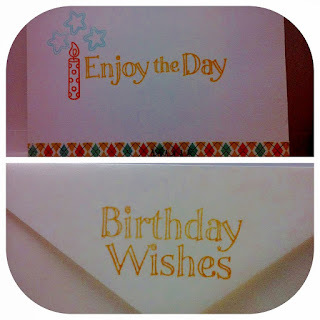 The sketch I chose was a basic card shape with a rectangular image in the middle, and a sentiment banner across the interior rectangle. The technique was masking and using multiple shades of ink. I actually have two cards...just to show you how your choices can really affect your card outcome even using a sketch. My first one, I thought I could get a little creative. I decided the card should be shaped, I used a Spellbinders die, then I picked out 4 shadow ink colors from Hero Arts, a hydrangea stamp from Penny Black and a sentiment from Hero Arts. 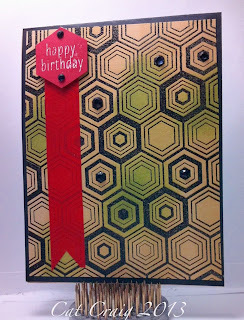 I cut strips, masked off the interior space did my stamping, and here was my first attempt. I know its something that would take even a Mother a while to find something complimentary to say. But that is okay, because I even laughed at it, and I tried again instead of becoming frustrated. It wasn't the sketch, or the technique...but my color choices...hideous. 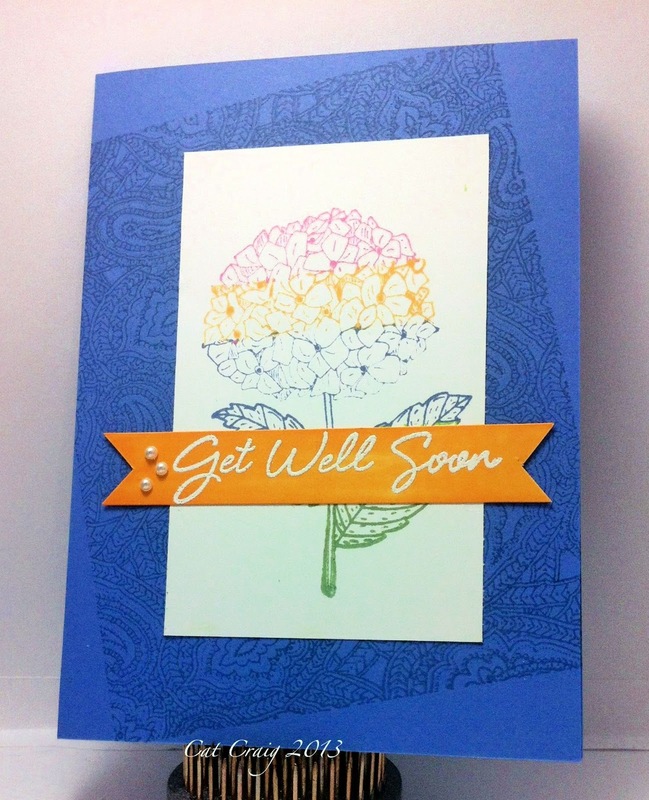 Card attempt 2, I added darker ink to the flower and used it for my background. I chose a complimentary color (also in the flower image) which showed a lot of contrast for the banner sentiment. Once again, I am reminded that planning helps. My most favorite cards have been fussed about, I've had a vision of them in my head. Time to get out of my fly-by-the-seat-of-my- pants style...save that for the timed challenges. Thanks for stopping by. Hi everyone, I got a bit behind after my 2 am crafting session. So today is catchup. I have homework cards from Online Card Classes Clean & Simple Card Making 2. Day 4, Day 5, and a bonus day! Day 4's lesson was about "White Space" or in other words unused, unblemished, free from any sort of tampering blank card face. We were given 3 examples, one on a neutral card base, then two on dark card bases. I had fits with this one, and finally decided to kinda blend two of the lessons...the white ink on blue card, and a chalkboard type with a bit of red, and some embossing. I went with the blue card, and put a sentiment on it. I added more flourishes than the stamp originally included - going so far as to snag squiglies from a wholly unrelated set. It was stamped in Versamark, and white embossed. I found an embossing folder with some curved lines to place along the bottom of the card, and as it is February...added a red heart gem. Its not quite inline with the lessons...a bit of a mosh pit of them all...but and this is important...I LIKE IT. 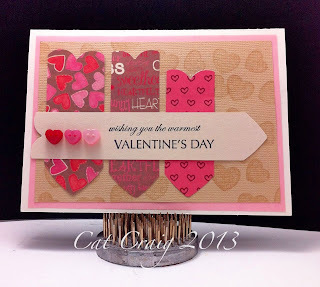 Day 5's lesson was a refresher quickie about using your stamps 3 ways, out of the ordinary placement, using bits of them but basically giving your stamps multitasking duties. 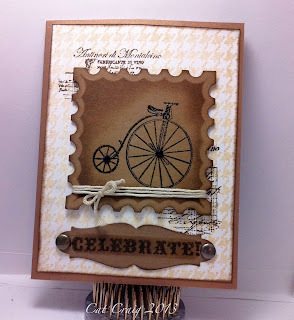 I previously took the Stretch Your Stamps class, and it was nice to get a refresher. One of the example cards I LOVED LOVED LOVED had a wonderful new stamp from Hero Arts (which sadly I do not yet own) placed on its side. Such a cool and interesting look. 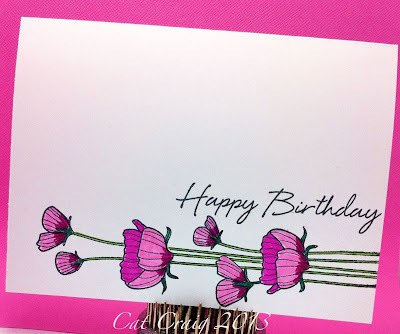 So I grabbed the longest stemmed flower stamp I had and tried it. 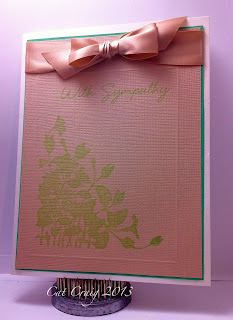 Something else new I did...colored it with sharpies on some wonderfully smooth Stampin Up whisper white cardstock. A black Happy Birthday sentiment and I am happy with the results. Bonus day...using die cutting and CAS. I just got this sweet little heart die from Memory Box, and the sentiment was in a Hero Arts decorate it set. I love black white and red as color combos. 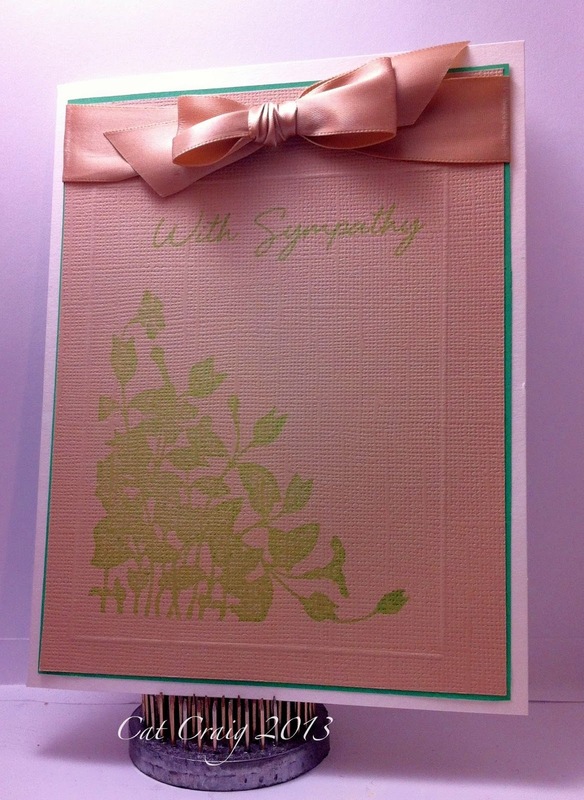 This too is a cute little card, 3.5 x 2.75 inches. Love these little cards. Have a wonderful weekend, enjoy the Superbowl if you are so inclines and I'll be back next week.